In order to understand the significance of combining psychotherapy with complementary and alternative therapies (CATS), it’s useful to have a little background on both. Most people are familiar with the terms “therapist,” “psychotherapist” or “marriage family therapist.” All of these titles help differentiate the counseling mental health professional from other types of therapists, such as a massage or physical therapist. What exactly does a psychotherapist do? It varies widely depending on theoretical background and personal preference. Generally speaking, psychotherapists counsel individuals, families and groups about psychological well-being. As you can imagine, this can cover a broad amount of subject matter since all the aspects of our lives – physical, emotional, and spiritual – affect us psychologically. A psychotherapist theoretical approach has a lot to do with the school he or she attends. Other influences include special trainings, and certifications and, of course, the person with whom the therapist is working. A psychotherapist apt to combine natural methods of healing, such as naturopathy and nutrition, would be holistic in nature. Holistic psychotherapists use any of a wide variety of techniques, such as somatic methods of healing that involve touch. When treating a patient, the holistic psychotherapist considers the whole person; mind, body and spirit. There are many different approaches to psychotherapy, but all effective therapy shares common elements, such as helping the client to process life events and improve overall functioning. As to which type of psychotherapy works best, there is no simple answer. Just as people respond differently to various foods and drugs, the same therapeutic approach won’t work for everyone. Many people find that a blended approach – one that draws on elements of different schools of psychotherapy – works best. 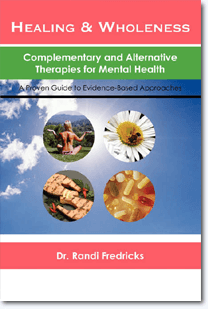 The above excerpt is reprinted from Dr. Randi Fredricks’ book Healing & Wholeness: Complementary and Alternative Therapies for Mental Health © 2008. No part of this article may be reproduced in any form or by any electronic or mechanical means, including information storage and retrieval systems. Disclaimer: This article is not intended to provide medical advice, diagnosis or treatment. Views expressed here do not necessarily reflect those of Dr. Randi Fredricks as articles often present the published results of the research of other professionals.